In bowl, combine vinegar, oil, water, rosemary, garlic, cumin, salt, peppers and coriander. Reserve 1/4 cup for basting. Add lamb cubes; toss to coat. Cover and marinate in refrigerator 6 to 8 hours. Drain meat cubes; discard marinade. 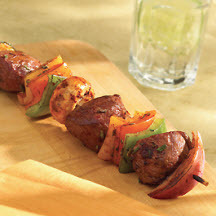 Thread lamb, cantaloupe or pineapple and green onion onto skewers. Brush with reserved marinade. Grill over medium-hot coals. Broil 4-inches from heat source. Cook for 12 to 18 minutes or to desired degree of doneness. Turn several times and brush with marinade. Nutritional Information Per Serving (1/4 of recipe): Calories: 234; Total Fat: 10g; Cholesterol: 63mg; Total Carbs: 15g; Fiber: 3g; Protein: 21g; Sodium: 357mg.